Blank Buster Klinkhammer Scarlet has been created by Sandy Dickson as his variant of the traditional Klinkhammer created by Hans Van Klinken. The Blank Buster Range is a range of flies developed by Sandy to imitate flies in their different stages of development from buzzer, emerger, to dry fly and as a lure pattern for still waters. This is definitely an essential fly. This excellent fish-catching fly was originally devised by the innovative Dutch fly-tyer Hans Van Klinken. 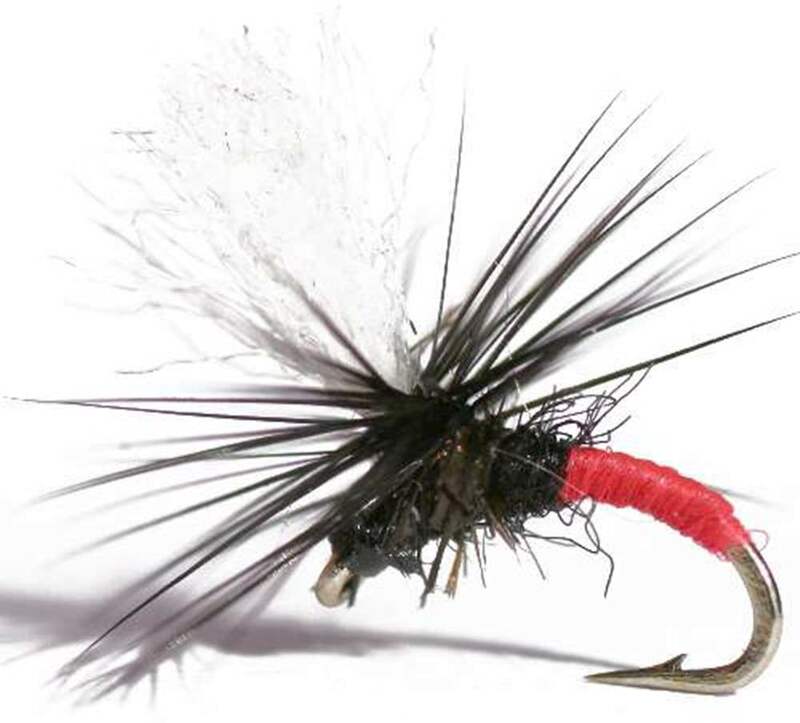 The fly, which hangs down in the water supported by the parachute hackle,could be classed as an emerger, an aquatic insect on the point of hatching; whatever the classification, the trout certainly find it extremely attractive. It has been effective on English chalk streams for both trout and grayling. The hackle has floatant applied with the body taking in water so that it sits low as an emerger. Sandy has added his own unique twists to this fly, using the Blank Buster ribbing along the body and a hot spot tag which has been deadly throughout the Blank Buster Range. In this case the Hot Spot Tag is in Scarlet which is deadly for Grayling as well as trout. The Blank Buster Klinkhammer Scarlet is an incredible fish catching fly originally devised by the innovative Dutch fly tyer Hans Van Klinken for trout and grayling. When on a course with Oliver Edwards he said that the Klinkhammer fly should be "kept in the car glove boxe next to your pack of emergency condoms" ....... this fly is absolutely incredible, even when fish are not taking on the surface this fly is known to 'lift' fish.The fly hangs down in the water supported by the parachute hackle. Due to to body of the pupa sitting under the surface while the hackle and wing are on the surface it represents an emerging caddis fly. The Blank Buster Klinkhammer Scarlet is tied with Black and Yelow Poly posts which increase visibility as light changes with the variance of the two colour posts. The Blank Buster Klinkhammer Scarlet is effective on everywhere from English chalk streams to rivers world-wide. As the name indicates dry flies which include Blank Buster Klinkhammer Scarlet are designed to float on the surface of the water. Trout dry flies types which include Blank Buster Klinkhammer Scarlet imitate a wide variery of flies and insects which inhabit the surface of the water. There is nothing like using dry flies and watching trout and grayling rise to the surface. To purists dry fly fishing is the true art-form of fly fishing, indeed some rivers only permit dry fly fishing. There are some dry flies (e.g. the Popper, Muddlers) which are designed to attract fish by the action of creating a surface disturbance. The flies are made from very bouyant materials (e.g, cork, ethafoam or deer hair, the latter having a generous application of floatant). A Muddler retrieved upwind of a rise can often result in a bulge in the water as the fish follows the fly. A dry fly like Blank Buster Klinkhammer Scarlet has flotant (Gink is the most popular) warmed in your hand and gently rubbed into the hackles to help Blank Buster Klinkhammer Scarlet float and they are usually cast singly on a trout tapered leader. A floating line is used, but with the tapered leader de-greased so that it does not glint and flash light spooking the trout. The Blank Buster Klinkhammer Scarlet is fished by putting floatant on the wing post and moistening the body (I put it in my mouth and use spittle to make the body wet and sink into the surface film). The fly is then floated down stream with constant mends as appropriate to stop the Blank Buster Klinkhammer Scarlet skimming the stream as it must float naturally at the speed of the current. Speedy service. Well packaged. Would recommend.